This may look to the average person as some what of a mess... when actually its a "work of art" in progress.... invites and cupcake picks.. I am a punchin lady at the moment! Get it? No mouths .. yet...cannot speak... ok.. you are a tough crowd today! Won't they make a great invite for a 3 year old's birthday party - since their cousin 'stole' the cupcake party idea party? I do not have hard feelings about this, I will make whatever she wants.. but my supplies available were for cupcakes... but now the "cupcakes" that will be there - will have "monkey faces" on them. 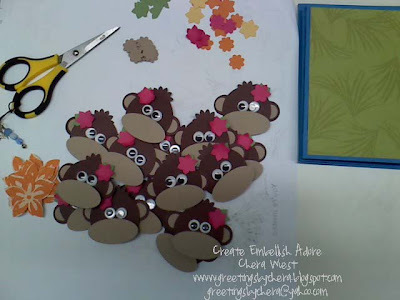 I have enjoyed punching these little monkeys out, they all have personalities of their own! When you are entering the 25 monkey stage you gotta love them! 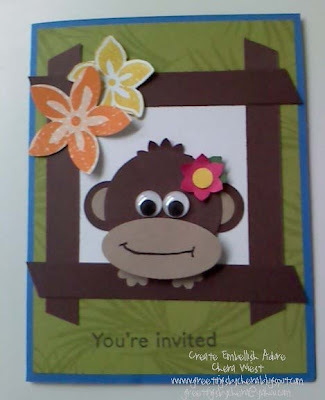 I think they are adorable... and on your birthday you should monkey around a little! I think the googly eyes won my sister over... I mean the flower in the hair runs a close second... but I am just sayin'. These are just darling! Love your idea. Loving these adorable little monkeys - how cute is this with those googly eyes!! Thanks for sharing.